I doubt that lagoon will ever develop it for rides or anything... looks like a majority of that land is horse property. So I would imagine then using it as a way to buffer the park from the public housing. Murray did something like that with the middle school on State street. They purchased all of those houses to make way for the new school and then sold/or attempted to sell the property up by state street. I can kinda see them using it for office space sometime in the distant future. (01-28-2019, 06:25 PM)DeLorean Wrote: I doubt that lagoon will ever develop it for rides or anything... looks like a majority of that land is horse property. Actually, Hillcrest was rebuilt the way it was for Earthquake Safety. Old Hillcrest Jr. High was Hodgepodged on the hill, with the Original School Building from 1905 on the top of the hill, and the second oldest, fr 1940, on the Bottom. In between was built in the 1960s/1970s/1980s, finishing with the New English Hall in 1995, which was moved out of the 1905 building. The Original Building from 1905 was still in use until 1997. I, unfortunately, still haven't been in the New Jr. High, but at least my Sister's Class of 2006 was the first to go through the New Murray High. They can leave the river rats to drown though. Lagoon can do with their land what they want, regardless if they are using it for Cattle or Horses. The time will come when they use it all. Well that was really great. Thanks! So is anybody else seeing a launch with a dead end on one side? I don't really see how roller coasters can come to a dead end without reversing. (02-09-2019, 12:29 AM)jetstar2 Wrote: Well that was really great. Thanks! It will be interesting to see how it shapes up. 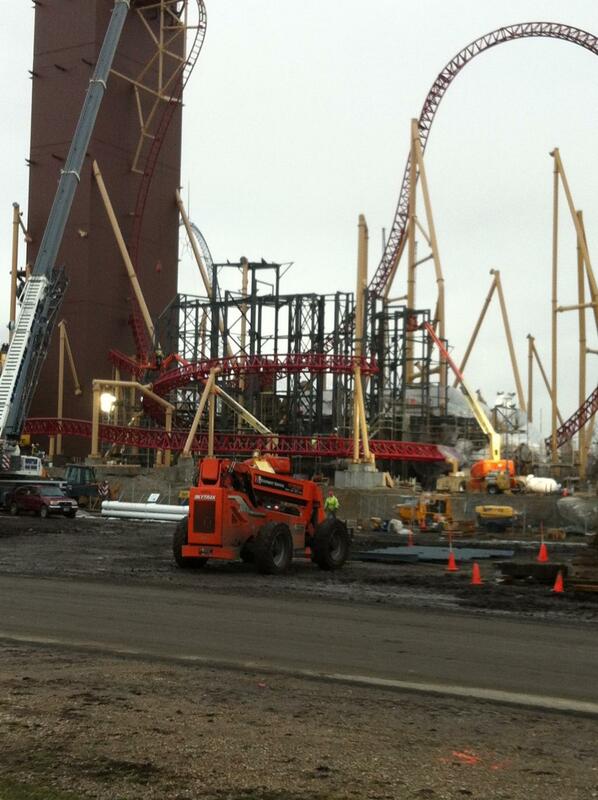 Maybe they are just going to install Volcano: A Blast Coaster since Kings Dominion announced today its being removed. LOL! Its a coaster in a mountain. Indeed, always great to see the new updates! Shame about all the spots with the 90% opaque masks, darn it. Y'know, I may be crazy (mostly because of how big the area looks), but the way the piles are all laid out with that many conduits coming up... almost looks like a maintenance shop/train storage/transfer track area being built. Would make sense right next to the electrical house. But it's just such a vast area. Good to see the tombs getting backfilled. I'm still trying to decide if the steel they've got piled up near the south end of the area with all the new conduits growing out of the ground is structural steel beams or track; it almost looks like the track sections they've got piled out to the west, and now I don't remember if I saw it all piled up down there before or not. (02-09-2019, 02:12 AM)DragonTamer Wrote: Indeed, always great to see the new updates! Shame about all the spots with the 90% opaque masks, darn it. Okay... So what should I be looking for? I am going to see about getting footage of the train area that they redid, DC the the new Biergarten. Anything else I should be on the lookout for? (02-20-2019, 11:50 AM)DeLorean Wrote: Okay... So what should I be looking for?